Contrasting with my last brewing adventure with pomegranates, this ground is relatively well-tread. It seems few homebrewers (and even several commercial breweries) can resist the oxymoronic pun of a rye wit. How did I fall into the trap (other than the oxymoronic pun, of course)? I remarked to my brother that I wasn’t sure what to brew next and he suggested a rye beer. Only having had a rather harsh rye IPA, I decided to do some research about what rye is all about. Rye imparts a spicy graininess and slight sweetness that is unique in character. Many brewers alluded to rye bread, which I could appreciate. Rye bread has a distinctive sweetness to it, unlike any other bread I’ve tasted, and it remains my bread of choice for most purposes. As summer leans into fall, it seems like a witbier with a hearty helping of rye could well capture the idea of the harvest — grain, spice, and even the hazy sunset appearance of the beer itself. It’s a very straightforward wit, just with rye composing about 19% of the grist. Apparently around 20% the rye flavor comes through noticeably, and is the starting point most often suggested by homebrewers for one’s first rye beer. My orange and coriander additions for the wit are on the low end of the spectrum for the style to ensure that the rye doesn’t get masked, especially by the coriander. The brew day itself was a little perplexing. I forgot to account for the rice hulls I was using to aid lautering, and didn’t use enough strike water, undershooting my mash temperature by 7 degrees F. I brought about a gallon of water to a boil and stirred it into the mash, achieving my target of 152 degrees F, which I held for an hour with only a two degree loss. I batch sparged with 3.5 gallons at 177 degrees F and collected a total of 6.15 gallons of runnings. The first shock of the day was that the runnings measured 1.03 in gravity. My first thought was that adding boiling water must have denatured some of the enzymes in the mash. While I didn’t taste the wort or conduct an iodine test to confirm conversion, even dissolved starches should’ve given me a higher gravity, so I doubt that the boiling water had anything to do with the gravity. Such a low gravity would put my mash efficiency at an abysmally low 55%, despite double crushing my grains and using a new (much more accurate) thermometer. Undeterred I started my boil in my new kettle, and simply added the half-pound of DME I had on hand to hopefully boost the gravity by 4 or 5 points. The kettle never boiled as vigorously as I’d hoped. With 3.5 gallons in my stainless kettle, I could maintain a violent enough boil that I wouldn’t run the gas wide open, but with 5+ gallons in this aluminum kettle things seemed pretty tame. Once the boil was done, I ran tap water through my chiller, which brought the wort down to about 90 degrees F in 20 or 25 minutes. I then switched to pre-chilled water, which took it down to 75 degrees in three circulations, but by then the pre-chilled water itself was reaching room temperature. In the future I’ll try to be more patient and save the pre-chilled water until I’m at least down to 80 degrees. I strained the wort into the fermentor and put it in a cold water bath, pitching after about an hour and a half, with the bath reading 65 degrees. 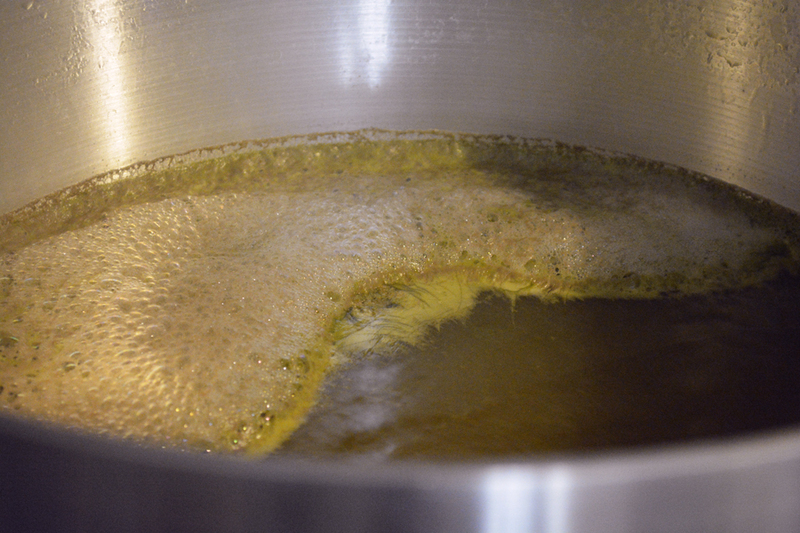 By the time krausen showed up (just about 3 or 4 hours later) I had stabilized the bath temperature in the high 60s. The biggest headache, however, was the cleaning and the added complexity introduced by handling a lot of equipment. I also bottled the Saison du Pom on brew day, so that equipment was added to the excess I used due to not planning how I’d change my routines for moving around water and wort. For the next brew, I’ll spend some time planning my volumes and equipment. UPDATE: I realized I forgot to include the OG, which was 1.051. The beer is finished fermenting with a surprisingly low FG of 1.010, bringing it to 5.4% ABV. There was an off aroma that appeared after I left the beer to fend for itself while I was out of town, which seems to subtly linger in the beer. The temperature climbed to 80 degrees, although fermentation had slowed to a crawl by the time I left. This probably explains the high attenuation as well. Regardless, the flavor seems pretty enjoyable already, so I’m hoping that when it’s finished it’ll be a real treat. 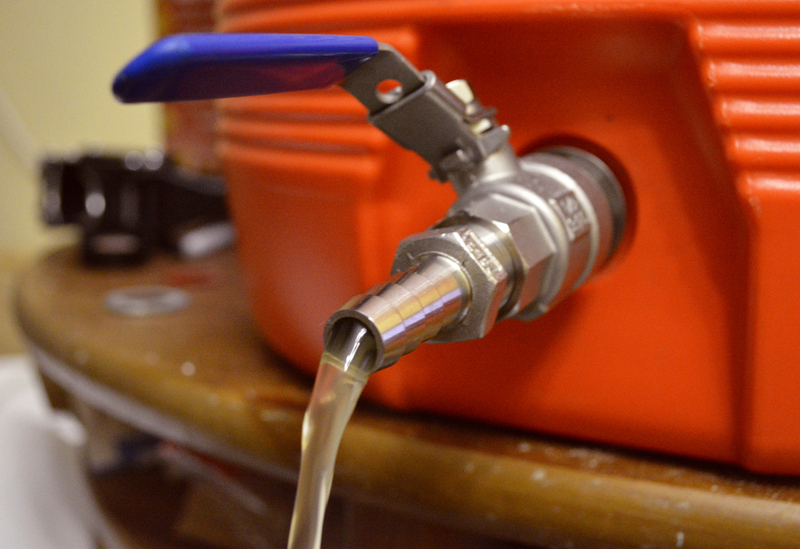 This entry was posted in beer, brew day, equipment, learning, recipes and tagged Belgian, DIY, immersion chiller, narrative, rye, witbier, wort chiller on August 25, 2013 by Dylan Bargteil.